BCO330T Combination Steam, Espresso, Drip Coffee, Cappuccino and Latte Machine from De'Longhi allows you to easily prepare your favorite espresso drinks and make customized cups of coffee like a barista. Accuflavor selector allows you to dial in your preferred coffee brew strength. Patented Flavor Savor brewing system fully saturates and steeps drip coffee for a full, robust taste. Combines a cappuccino and espresso machine plus drip coffee maker in one convenient, space-saving design. Integrated Swivel Jet Frother mixes steam and milk to create a rich, steamy froth for lattes and cappuccinos. LED-lit freshness indicator illuminate to let you know how long coffee has been standing since last brew cycle. Integrated cup storage tray warms your cups for a satisfying coffee drinking experience. Warm function keeps a whole pot of coffee warm for up to two hours via a nonstick carafe warming plate. Brew and pause function allows you to pour a cup even in the middle of a brewing cycle. Includes a 10-cup glass carafe. Removable water tank with water level indicator. LED-lit push-button controls with LCD display. Advanced carbon water filtration system eliminates chlorine. 24-hour digital timer allows you to program the precise moment you want to enjoy a fresh, piping hot pot of coffee. Stainless steel and plastic housing. 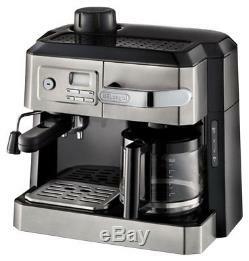 Dimensions: 11" D x 14.5" W x 12.8 H.
The item "DeLonghi Coffee Center Coffee Espresso and Cappuccino Machine BCO330" is in sale since Thursday, September 20, 2018. This item is in the category "Home & Garden\Kitchen, Dining & Bar\Small Kitchen Appliances\Coffee, Tea & Espresso Makers\Espresso & Cappuccino Machines". The seller is "cosmeticbrands" and is located in Brooklyn, New York. This item can be shipped to United States.